"Unlimited - Chapter 1: Injustice League"
Lex Luthor, the Joker and Cheetah look over photos of their fellow villains in an effort to decide who to recruit for their team. The Joker's choice of Dr. Light irks Cheetah, who is already annoyed at the Joker for staring at her chest. Luthor points out that they can't use good character as a standard for membership before Cheetah interrupts him to concede. Meanwhile in Happy Harbor, Rhode Island Hal Jordan frantically tries to get some cash to pay off the strippers he hired for Ollie's bachelor party. Batman gives Hal a hard time about it but concedes to loan him the money. Roy tells Hal they have a problem as the press has gotten wind of the party. The celebration is moved to the Hall of Justice and a good time seems to be had by all. Hal asks John to split his Justice League duties to allow him more time for his Green Lantern obligations. Following a tip Firestorm travels to Manhattan in his search for Martin Stein. Gehenna, his girlfriend and the one currently joined with him in the Firestorm matrix, keeps telling him that they are walking into a trap, which turns out to be the truth as Killer Frost attacks. The battle is quick and fierce but Firestorm is able to subdue Frost. Suddenly Luthor, Joker and Cheetah appear and make quick work of Firestorm. After getting hit with a dose of Joker venom the Cheetah savagely slashes at Firestorm again and again and again. Afterwards they free Killer Frost and take her to the Hall of Doom where they offer her membership in the Injustice League Unlimited. Simultaneously Wonder Woman, along with Hawkgirl, and Batman, along with Red Arrow get word of the attack on Firestorm. Diana and Kendra go to see Firestorm in the hospital, who is recovering despite his wounds. Roy and Batman go to the scene of the crime to investigate what happened. After Luthor delivers a stirring speech on why he has assembled them together the Joker leads a team to take on the Batman and Red Arrow. Cheetah leads Dr. Light and Killer Frost in an attack at the hospital. Wonder Woman is captured after Hawkgirl manages to escape back to the Hall. There she tells them of their defeat. With a stern resolve, Superman declares that the party is over. Story - 5: I can say without any hint of hyperbole and with a complete and total awareness of how much I'll look like a complete fanboy that this was the probably one of the most awesome Justice League stories I have ever read in my entire life. I don't think I have been this satisfied with a comic in months. It's like someone heard me talking about the fact that JUSTICE LEAGUE UNLIMITED was quite possibly the greatest example of DC characters in animated form and how I really hated that the show was cancelled and how it would be so cool to see it come back. Well now, in a strange way, it has. Though I wish the characters would start moving. This is the worst cartoon I have ever seen. In all seriousness this comic was a great treat, kind of like ice cream when you're not expecting it. I had my comic shop place the book in my hold box because it was Justice League related and I was expecting more of a character piece about Ollie and Dinah's upcoming nuptials. I was not expecting the first chapter in McDuffie's introductory arc on the book. The angry, bitter, jaded fan that I have become in the past few months was kicked out of the clubhouse for a few hours in favor of the upbeat, cheerful, enthusiastic fan of old. I mean I'm sure all of this is connected to COUNTDOWN somehow, but for the moment I just don't care. The story was fun, action packed and just put a big ol' smile on my face. McDuffie is great at the trifecta of dialogue, plot and action. The beginning of this issue was hilarious. I have not laughed like that at a comic in some time. I don't think Dwayne was making fun of Meltzer but he did parody the first few issues of JUSTICE LEAGUE OF AMERICA in good fashion. Because of Dwayne's connection to JLU I actually "heard" Mark Hamill and Clancy Brown's voices for the Joker and Lex. And the fact that McDuffie used the chest shots from issue one of JUSTICE LEAGUE to humorous effect was great. Again, I didn't detect any malice here, just a fun way to open a comic. The mix of current DC villains and concepts from JLU (adding in VILLAINS UNITED and "The Society") went down easy. I like the Hall of Doom. I mean Meltzer gave the League the Hall of Justice a la the SUPER FRIENDS, so why not a Hall of Doom? And the fact that the name of the group is the Injustice League Unlimited was another nice touch. Yeah, I admit that it appeals to both the five year old in me that loved CHALLENGE OF THE SUPER FRIENDS and the die hard super-hero fan that loves nothing better than to see a huge team of heroes take on a huge team of villains, but the fact that the story itself is also good makes it easier for the adult in me to justify liking it so much. Not that I needed much convincing. The adult in me also digs seeing a huge team of heroes taking on a huge team of villains. It's the great thing about people in my generation; not only do we cling to certain aspects of our childhood we're actually encouraged to. So the stage is now set. We've had a couple of big fight scenes. We had Batman actually acting like he has a sense of humor or a soul or some combination of the two. The villains are getting organized again. The heroes have been gathered together. Things are about to get good. And for those of you who were expecting or thinking that we saw more in the way of character development, action and intrigue in this one special then in Meltzer's entire run, well I am going to disappoint you. Yeah, this special has more my speed, but bashing Meltzer's run feels like bad form and, more importantly, it isn't constructive. Let's focus on the good and move on. Part of me feels like I was mislead with this special since I was expecting one thing and got another. The other part of me feels like that part should just shut up and enjoy the book. Art - 5: I've liked Mike McKone's art since his several issue stint at the beginning of Jeph Loeb's run on SUPERMAN. Andy Lanning's inks compliment the pencils and the art has a very polished look to it. I was also happy with the amount of emotion and character McKone and Lanning infused into the characters. Hal's expression when he realizes the pickle he's in with the strippers was classic. This was a story that called for an art team that can handle a large cast and make them look distinctive and with McKone's experience with TEEN TITANS and Andy Lanning working on INFINITE CRISIS I'd say this was a good match for the material. 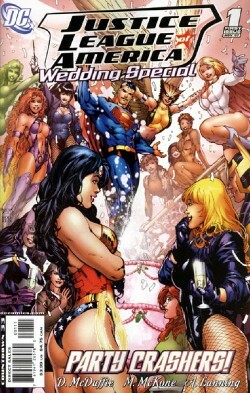 Cover Art - 5: I guess it's only fair to have Ed Benes contribute something to this special since he is the current JUSTICE LEAGUE artist. Actually this cover is rather reserved for him. Like Michael Turner Ed seems to enjoy drawing certain portions of the female anatomy and here is a cover chock full of women and they all look proportionate. Maybe it's Alex Sinclair's influence. Still, there is something amusing about Superman being the object of objectification here as he flies out of the wedding cake. So it looks good, it's amusing and despite the fact that it totally snowed me on what was going to happen in the actual comic, so it gets a five.